The reliable roofing contractors at Daech & Bauer Roofing have successfully completed more than 10,000 projects in the Maryville, Illinois area. Our passion for what we do is reflected in our exceptional service and products, as well as the level of workmanship we provide. And, we have extensive experience with the insurance claim process, so we can help ensure that your roof is returned to optimal condition after it has been damaged by severe weather. Additionally, the roofing contractors at Daech & Bauer Roofing are committed to providing our customers in the Maryville, IL area with a complete roof system that is designed to be the last roof they will ever need to buy in their lifetimes. To accomplish this, we focus on creating a waterproof barrier, providing strong adhesion so the roof will resist nature’s elements, and ensuring proper attic ventilation to slow roof deterioration and manage attic temperatures and moisture. And, once your roofing installation is complete, we back our work with a five-year labor warranty – on top of any product warranties – so you can rest easy knowing your investment in your home is protected. 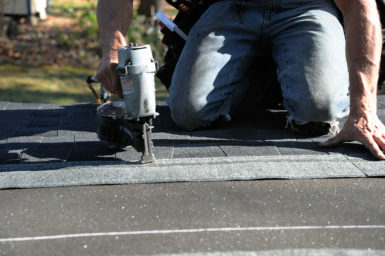 If you would like to learn more about the repair and installation services our roofing contractors provide for homeowners in the Maryville, IL area, contact Daech & Bauer Roofing today. Be sure to ask about our financing options, which offer low monthly payments.